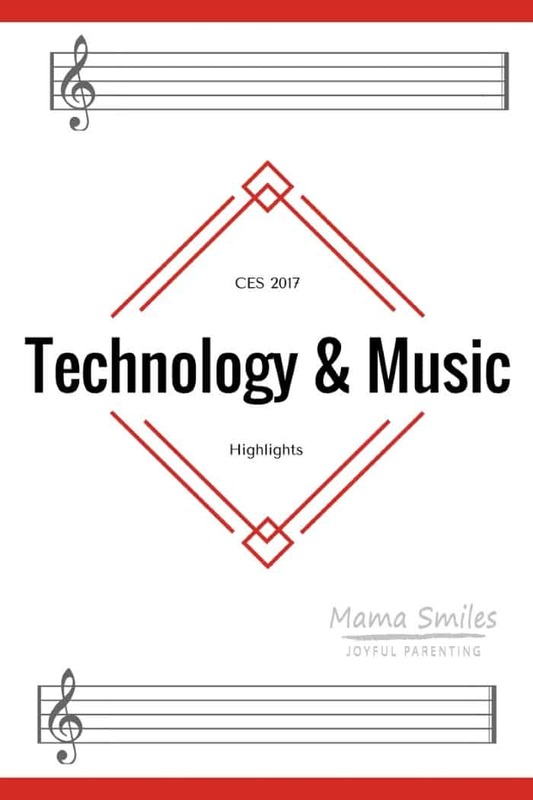 CES 2017 featured some amazing new music technology. The ONE smart piano is making music education more accessible than ever before. This is the one piano that anyone can learn to play! Have you always wanted to play the piano, but never got a chance to take lessons? Do you have kids who want to play, but no affordable teacher? Or, maybe you have a teacher but your children resist practicing? The ONE piano could transform your life. The ONE smart piano company contacted me before CES, offering to send one of their smart piano keyboards for us to try. With four little pianists in the house (as well as Mike and I both playing), I was eager to give it a go. We were sent the ONE smart keyboard, and I got to play with the piano featured above at CES. The keyboard feels like most keyboards, and the digital piano has weighted keys that feel more like a traditional piano. This is no ordinary keyboard. You can plug an iPad into it, and it will light up the keys for you to play, either alongside traditional sheet music or with another app that visualizes the keys. This allows novice players to perform pieces that they would not ordinarily be able to play. It also opens the door for a non-musician to learn that one piano piece that they always wanted to play – without having to build a complete piano skill set first. Here is a video of seven-year-old Lily sight reading some sheet music that would typically be way beyond her current ability. Between finger numberings (which she is not always following), highlighted notes on the page, and the lit up keys, she can play the piece. What Lily is doing here will not “teach” her the piece perfectly, but that’s because she isn’t following the steps the app sets out. If she follows through step by step – listening first and then working through careful practicing steps – she will be able to truly play the piece. Even playing in the somewhat sloppy manner you see in this video, she is learning a lot about sight reading that will help her throughout her musical career. If you have ever looked into pricing piano lessons, you know that studying music is a luxury. The ONE piano learning system is trying to change this. They partner with Hoffman Academy, the online piano education program that all four of my children use. We can’t afford piano lessons times four where we live. Hoffman Academy starts off free, and the family license (which we do pay for) is very affordable. Your child will learn quite a bit with the free version, but I do recommend upgrading if you can afford to. Did you hear Johnny talking in the video about needing the next lesson? He is asking me to print out more Hoffman Academy lessons. This is an incredible program. 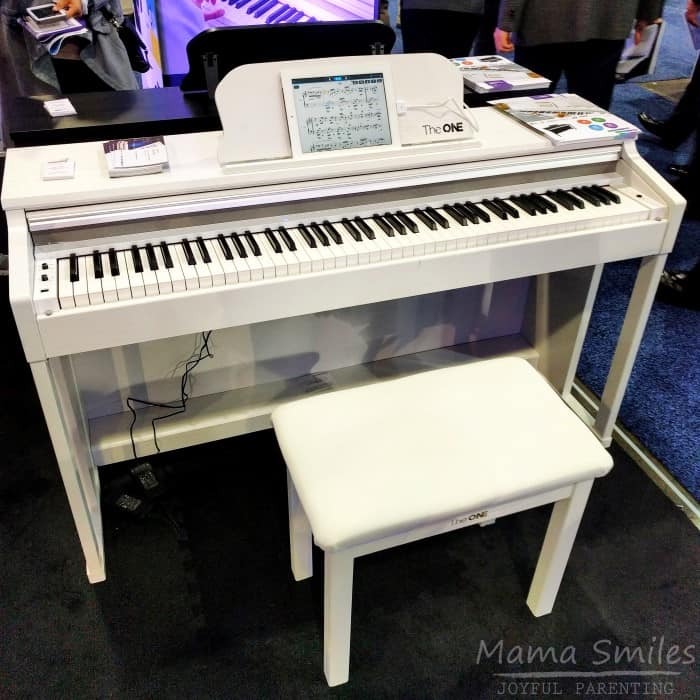 The ONE piano exhibitors also introduced me to Smart Music, a company that is launching another piano education program they are partnering with. This program also has free and (affordably priced) paid versions. I plan to try it out with four-year-old Anna, who I think will enjoy the animations. Smart Music is designed to be used with an entire class of students. Students can even compete with one another to see who can play a piece more accurately. I am a classical musician, and I truly hope to own a nice traditional acoustic piano someday. But I am excited to see instruments like The ONE piano, and programs like Hoffman Academy and Smart Music, that are bringing music education to more children – and adults – than ever before. Learning an instrument teaches self-discipline and focus. Musical instruments allow children (and adults) to access and express emotions that they might struggle to put into words. Playing an instrument trains your brain to recognize patterns – a skill that helps with math, science, and engineering. Do you play the piano? How about your kids? Is there a piece of music that you always wished you could play on the piano? Note: We received The ONE piano keyboard to review. I received no other compensation, and all opinions are my own (and those of my family members). This is a wonderful use of technology! Transformational for reinforcing good practice habits if you do have a teacher, or introducing new pieces if you don’t. Very cool. I play piano very badly, but that looks pretty cool. I wonder if any of my kids would like to learn how to play (beyond their randomly hammering their Mimi’s piano when they visit). This piano sounds great for sight reading, my kids’ nemesis!